About: Also known as hard eye, glaucoma is an increase in the intraocular pressure (IOP), leading to damage to the optic nerve, which connects the eye to the brain. Any damage can cause partial or full blindness. Causes: Trauma, diabetes, infection, displacement of the lens, advanced cataracts and tumours of the eye. Symptoms: Pain, squinting, redness, dilated pupil in the affected eye, one eye appearing larger than the other, cloudiness of the cornea and vision loss. Diagnosis: Baseline tests to evaluate the overall health of your cat as well as a thorough physical examination. Tonometry to measure the pressure of the eye, ophthalmoscopy to look at the optic nerve, ultrasound and FIV and FeLV tests. Treatment: Medications to bring down the intraocular pressure, steroids to reduce inflammation and analgesics to relieve pain. Also known as hard eye, glaucoma is an increase in the intraocular pressure (IOP) in the eye. The eye contains a transparent jelly-like fluid known as intraocular fluid or aqueous humour, which maintains the shape of the eye and nourishes the tissues within the eye. The ciliary body is constantly making intraocular fluid. It drains away at the angle where the iris and cornea meet, exiting via a series of drainage canals (trabecular meshwork) and is reabsorbed into the bloodstream. This fluid in/fluid out should occur at the same rate, to keep pressure within the eye stable. Glaucoma occurs when fluid continues to be produced, but drainage slows down due to a partial or complete blockage which impedes outflow. A build-up of fluid and increase in intraocular pressure develop as a result which damages the optic nerve (a nerve that transmits visual information from the retina to the brain). A damaged optic nerve can cause partial or full blindness. Glaucoma can be primary or secondary. It can affect one eye (unilateral) or both eyes (bilateral). 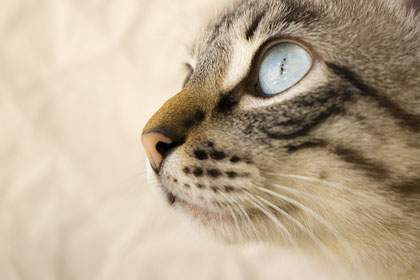 Primary glaucoma is rare in cats and occurs most often in Siamese, Burmese, and Persians. It is caused by a congenital eye abnormality and almost always affects both eyes (bilateral). Secondary glaucoma is when another eye disease is present. Whatever the type, the result is improper drainage and never an overproduction of the aqueous humour. 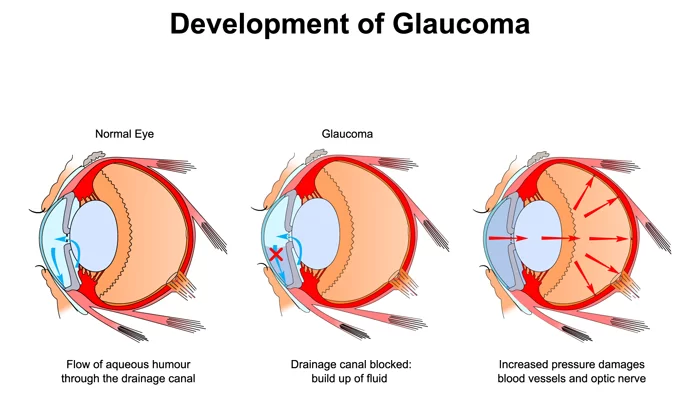 Glaucoma comes in two forms, open-angle, and closed-angle. Open-angle (wide-angle) glaucoma is the most common type and is caused by a slow and progressive partially clogging of the trabecular meshwork and slowing down drainage of the aqueous humour. Closed-angle (angle closure) glaucoma occurs when the iris bulges forward completely clogging access to the trabecular network. This is by far the most serious type of glaucoma as pressure can rise very quickly within the eye. What is the normal eye pressure in cats? The most common cause of glaucoma is uveitis (inflammation of the uvea), which leads to a build up of protein and debris which block the drainage ducts. Your veterinarian will perform a complete physical examination of your cat and obtain a medical history from you. He will need to perform some diagnostic tests first to determine if the cause is primary or secondary and if secondary (as it almost always is), to look for an underlying cause. Unfortunately, a large number of cats are already blind in the eye at the time of diagnosis. Baseline tests: To evaluate the overall health of the cat and check for diabetes with a biochemical profile, complete blood count, and urinalysis. Tonometry: Measurement of the pressure within the eye. Eye drops are applied to the eye(s) to numb them, then a tonometer is used to gently press the cat’s eye to determine how much force is required to flatten the cornea. The eye is harder (which means a higher pressure) in cats with glaucoma. Gonioscopy: Examination of the angle of the anterior chamber of the eye with a gonioscope. Ophthalmoscopy: To examine the optic nerve at the back of the eye. Ultrasound: To look for tumours, lens displacement, trauma. Fluorescein: A yellow stain is applied to the eye to check for corneal ulcers. The goal of treatment is to address the underlying cause, reduce pressure within the eye and relieve pain. Osmotic agents: These systemic medications can reduce IOP rapidly and works by increasing blood plasma osmolality, once plasma osmolality is greater than that of the intraocular fluid, water moves from the eye to the plasma reducing IOP. Mannitol, glycerin, and isosorbide are the most common osmotic agents. Carbonic anhydrase inhibitors: CAI’s reduce the formation of bicarbonate ions, which is necessary for aqueous humour production. Medications include topical and oral medications. Topical: dorzolamide and brinzolamide or oral: methazolamide and acetazolamide. Prostaglandin analogues: These drugs increase intraocular fluid from the eye. Medications include prostaglandin analogs such as latanoprost, travoprost, unoprostone and bimatoprost. Beta-blockers: These medications reduce aqueous humour production although the exact mode is not understood. The most used medication is Timolol, but other options include levobunolol, betaxolol, metipranolol, and carteolol. Cryosurgery: To freeze a portion of the ciliary body which reduces the production of aqueous humour. Is glaucoma in cats painful? Yes, glaucoma is very painful. Can glaucoma kill a cat? Glaucoma itself cannot kill, but some of the underlying causes such as untreated diabetes and tumours. Is there a home treatment for glaucoma in cats? No, glaucoma needs to be treated by a veterinarian who can treat the underlying cause and prescribe medications to bring down pressure within the eye. Cat Rubbing – Why Does My Cat Do That?